The longevity and ongoing inventiveness of the progressive genre remains startling and the current wave of younger bands all vying for attention seems unabating. What’s perhaps more surprising are the musical reference points and influences which seep into the music, with young bands often referencing albums which are well over 40 years old. Emperor Norton are no exception, with the source of their inspiration often coming from surprising sources. 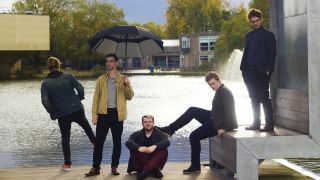 Emperor Norton formed in York at the end of February 2017, and quietly honed their material before trying to develop a momentum on the live circuit. Their first gig was supporting Syd Arthur, which Corry describes as a “pretty horrible” experience, with a poor sound hampering their determination. However, despite their troubles, the crowd reaction was positive, which encouraged them to press ahead with their approach. The result is their engaging self-titled debut album which was released earlier this year, and it’s a recording which has already garnered a number of positive reviews, much to their entertainment. The band have already gathered together material for another album, which is slated for release next year.